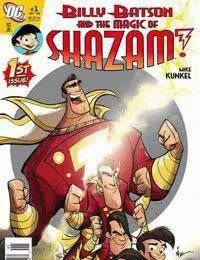 Billy Batson & The Magic of Shazam! Welcome to the brand-new, all-fun adventures of Billy Batson as the Worlds Mightiest Mortal — Captain Marvel, from acclaimed writer/artist Mike Kunkel (Herobear)!Thanks to a magical rift created when Captain Marvel battled Mr. Minds monsters, 14-year-old Theo Adam has been returned to Earth from banishment. For Theo, theres just one problem: He cant remember the magic word that gives him the powers of Black Adam. Theres only one solution: follow Captain Marvel and get the word out of his alter ego, 11-year-old Billy Batson.